Aloe vera gel may help prevent or reduce your wrinkles and other signs of aging skin. Most commonly used as a topical sunburn remedy, aloe vera gel may have other benefits for your skin, including preventing or treating wrinkles. Native to Africa, the aloe plant yields gel from its fleshy leaves and has a long history of use in treating cuts, scrapes and burns. Talk to your doctor before using aloe vera gel for wrinkles, especially if you have skin sensitivities or allergies. Aloe vera gel has many potential benefits for your skin, including treating the effects of aging on your skin, according to the University of Pittsburgh Medical Center. Aloe can also help in treating burns, skin ulcers and wounds. Aloe can soothe your skin and prevent damage from sunburns as well, notes the University of Michigan Health System. These benefits, along with treating dry skin, may lead to the prevention of or a reduction in wrinkles. Aloe vera gel contains polysaccharides like acemannon and other chemical constituents that appear to stimulate skin regeneration and healing, says the University of Michigan Health System. Aloe’s constituents also appear to have anticancer and immune system-modulating effects, as well as anti-inflammatory and antioxidant actions, notes the Memorial Sloan-Kettering Cancer Center. Aloe vera gel may act to prevent or reverse skin damage from sunlight exposure. In addition to treating or preventing skin aging, aloe vera gel may also help in treating cold sores, canker sores and pruritus, or itchy skin. 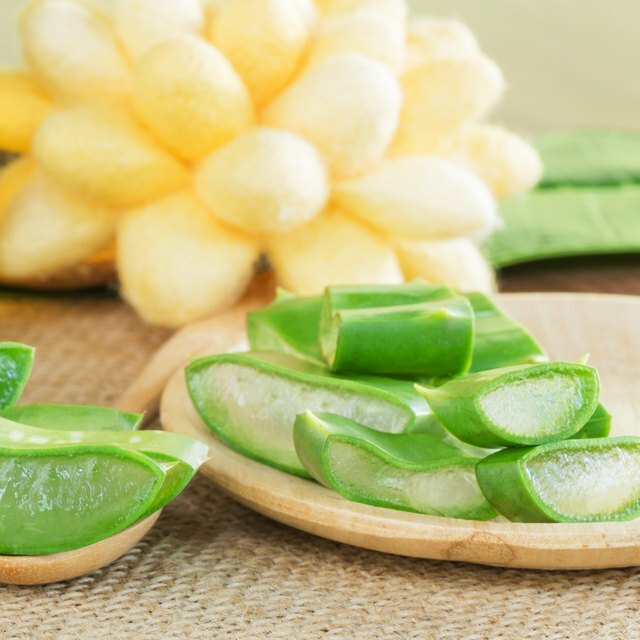 Topical aloe might offer benefits for treating genital herpes, psoriasis and seborrheic dermatitis, says the University of Michigan Health System. Taken internally, aloe offers laxative and blood sugar-lowering effects. Don’t use aloe gel internally for any purpose before first consulting your physician, however. In addition to aloe vera gel, many other natural remedies could help reduce wrinkles. These include thuja, calendula, chamomile, Dead Sea minerals, gotu kola, Vitis vinifera, arnica and coriander oil, says the University of Pittsburgh Medical Center. To treat or prevent the effects of aging on your skin, you might also take certain natural supplements like green tea, milk thistle, vitamins C and E, soy isoflavones and oligomeric proanthocyanidin complexes, or OPCs. Before you use any natural remedy on your skin or take a supplement orally, discuss the possible health risks with your doctor. Aloe vera gel rarely causes serious side effects when used topically, aside from a potential allergic reaction in some people, says the University of Michigan Health System. Don’t take aloe gel internally to treat wrinkles or other skin problems. Ingesting aloe can cause possibly dangerous or life-threatening side effects. Aloe vera gel may increase the effects of hydrocortisone creams and the topical drug called sevoflurane, notes the Memorial Sloan-Kettering Cancer Center. Using aloe vera gel along with sevoflurane could increase your bleeding risks during surgery, so don’t combine these remedies prior to a surgical procedure.